It's one thing to say you're a Christian. It's another to act like one. What this means is not necessarily blessing people continually and saying you'll pray for them, or even radical acts of compassion in the manner of the Good Samaritan. Instead it is those day-to-day choices we make which test whether or not we really are followers of Christ. 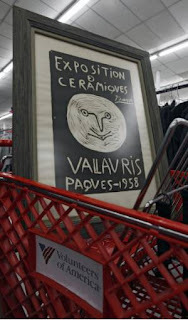 Take the local story here in Columbus of the "thrift-store Picasso," which is still making national news. Nobody in the story has said anything about religion, but choices made and words uttered are still instructive because any of us might find ourselves in a similar situation.